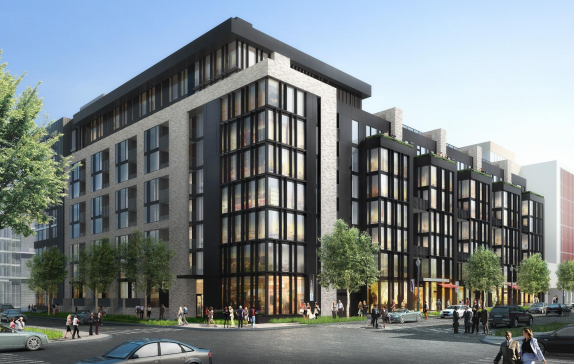 “880 P Street, a 142-unit market rate apartment building in the District is now under construction. This is the final phase of the award winning, 1 million square foot project developed by Roadside Development, LLC (Roadside). 880 P is one of four residential buildings, along with Cambria Suites Hotel, Giant Food and Convivial Restaurant, which comprise the City Market at O project located at 7th & O Streets, in the center of the Shaw neighborhood. “Shalom Baranes Architects has done a wonderful job in designing this stunning addition to the collection of existing buildings,” said Richard Lake, founding partner, Roadside Development. 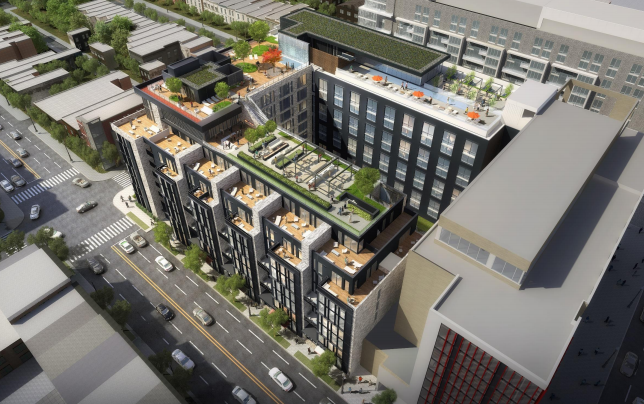 “This building, once completed will provide an elegant commercial edge to 9th Street, incorporating street front retail which will complement the thriving retail experience in Shaw,”. The units include a mix of junior one bedroom, traditional one bedroom, two bedroom and three bedroom units. Featuring clean smart design, with truly “livable” spaces. Many of the units will have private terraces with their own personal fireplaces. 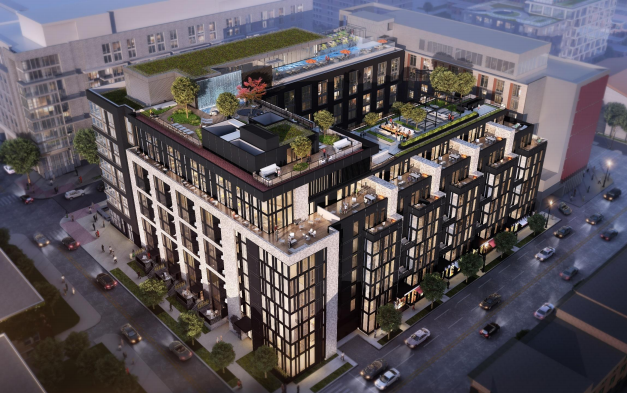 880 P Street features a complement of above market amenities and social environments for the residents of City Market at O, including a “Music Room” where residents can take lessons, jam and share their music. The roof features a 16-foot tall waterfall and reflection pool, seating areas and sunning stone, organic garden, boardwalk, outdoor bar and kitchen. Creating intimate outdoor rooms and dining areas, all while enjoy spectacular unspoiled views of this great city. 880 P actually connects with 800 P along the roof, allowing residents to easily move between the two buildings to take advantage of an integrated rooftop. City Market at O reveals how the successful intersection of old and new can create a place that truly appeals to long-term residents as well as new ones. The mix of market rate and affordable housing combined with new and old architecture creates a truly authentic environment that readily integrates with the neighborhood and has proven to be a catalyst development in Shaw. The environment along with the location appeals to people of all ages. Earlier phases leased up in less than six months.